Across from the autograph table were replicas of the famed “Silver Shamrock” Masks” (I dare you not to hum the iconic tune as you see them) and we enjoyed seeing them as well as the resurgence of appreciation that film is now getting. In the video you may wonder who we were referring to as “dying so young.” That would be in reference to one of the film’s producers, and HALLOWEEN alumnus, Debra Hill who died at the untimely age of 54 from cancer. A terrible loss to the horror community. This entry was posted in Celebrity Encounters!, Convention & Expos, Halloween, Masks, Models, & Props!, Slasher Movies and tagged DEBRA HILL, Don Post Studios, HALLOWEEN III: SEASON OF THE WITCH, HORRORHOUND WEEKEND, SILVER SHAMROCK, STACEY NELKIN, TOM ATKINS, TOMMY LEE WALLACE. Bookmark the permalink. 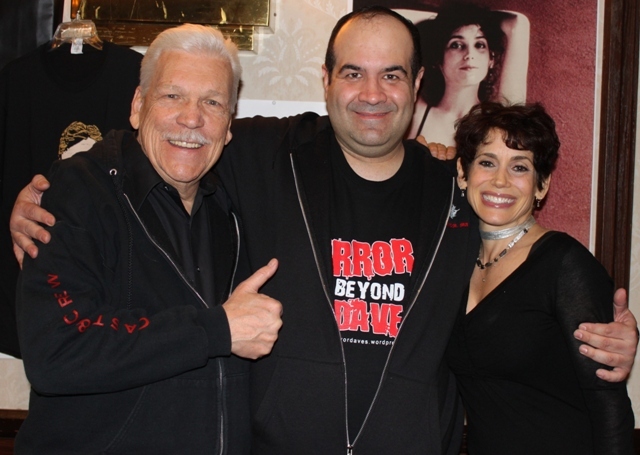 ← TALES FROM HORRORHOUND WEEKEND: The Mr. Lobo Roast!